Tichy Train Group HO Oil Tank Model Kit, 1qt Discounts Apply ! 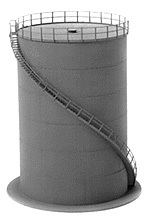 TTG7013 - Tichy Train Group HO Oil Tank Model Kit, 1qt. Includes spiral stair and vertical latter. 4" Dia x 6' Tall.